We saw in Part One what the different numbers written on most plastic containers mean. We concluded that it was clear that plastics could be recycled, even if some are easier to recycle than others. Why then is it so complicated? Why are plastics always seen as an almost impossible problem? Because of our consumption habits! Oh yes, dear readers, our consumption has a direct impact on whether plastics enjoy a second or even a third life. How so, I hear you say? So we then had three-layer or multi-layer packaging. However, as in nature, materials are fond of exclusivity, and each particular characteristic was specific to a different plastic. So they were laminated together to make a packaging that meets the requirements of the food… but is almost impossible to recycle. Remember, recycling doesn’t like mixtures. Bags of potato chips? Multi-layer. Packaging for frozen ready meals? Multi-layer. In short, problematic packaging with nowhere to go, apart from export under the name “Plastics 2 to 7″. We wonder what happens to these materials when they are exported… hm. Because they are made up of several different kinds of plastic, this type of packaging cannot be marked with one of the grades, so No. 7: “Other plastics” was invented. Now, to alleviate this problem, we have come up with ecodesign, which makes it possible to work to find mixed, recyclable solutions, adapted to our consumption habits. But it is not easy. I know that’s a downer, but what do you expect, I’m not here to lie to you. So you say, with a voice full of hope, plastics with single composition (only No. 1 or only No. 4) must ALL be recycled according to their numbers? Absolutely not! Most of them, still talking about food packaging, go through a sorting process (the blue/green or other coloured containers in front of your houses) and go onto a sorting table. So unless this line is equipped with optical readers that can separate packaging by numbers (yes, it exists! ), the person who is sorting will not have time to confirm the number on each piece of packaging. What is reassuring is that at least all transparent plastic bottles (No. 1) and opaque bottles (No. 2 or No. 5) have more chance of being recycled because they can easily be identified on the sorting table. 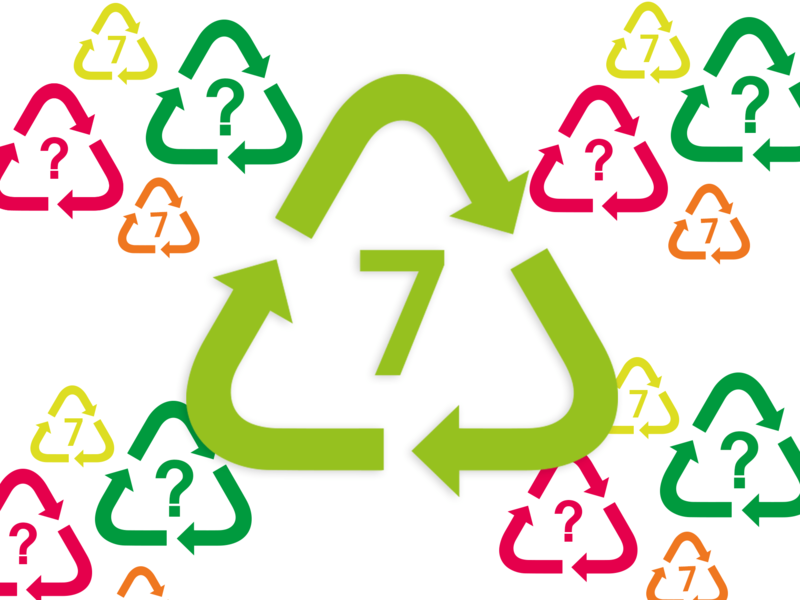 In most cases the rest of the packaging will be sent in the direction of “Plastics 2 to 7”. The same goes for plastic packaging, especially flexible films, which are used, for example, to package products such as electronic parts (addition of an additive to prevent static) or chemical containers (also multi-layer to meet the product requirements). In plain language, it is more common to find plastics made of different polymers than just one. This is one of the main reasons why it is difficult to recycle them. There are ways to achieve this, but are they enough? I can feel your excitement growing!